Wednesday January 18th 1893 We washed the rest of the things in the forenoon. Josie feels able to go to work again. The girls were over in the afternoon. Hatt and I dressed four chickens for them to take home with them. And after they had gone I dressed one for myself. Josie ironed in the afternoon. I read most of the evening. Thursday January 19th 1893 We ironed a few more things this morning. I was busy with the work all forenoon. I went to town in the afternoon to do the shopping, was at Hatties awhile The girls are busy getting ready for their party tomorrow night. Friday January 20th 1893 It snowed part of the day. I done a great deal of sweeping and cleaning. Will and I went to the girls "P.E.O" party tonight. We had a real nice time. The weather is not at all cold. 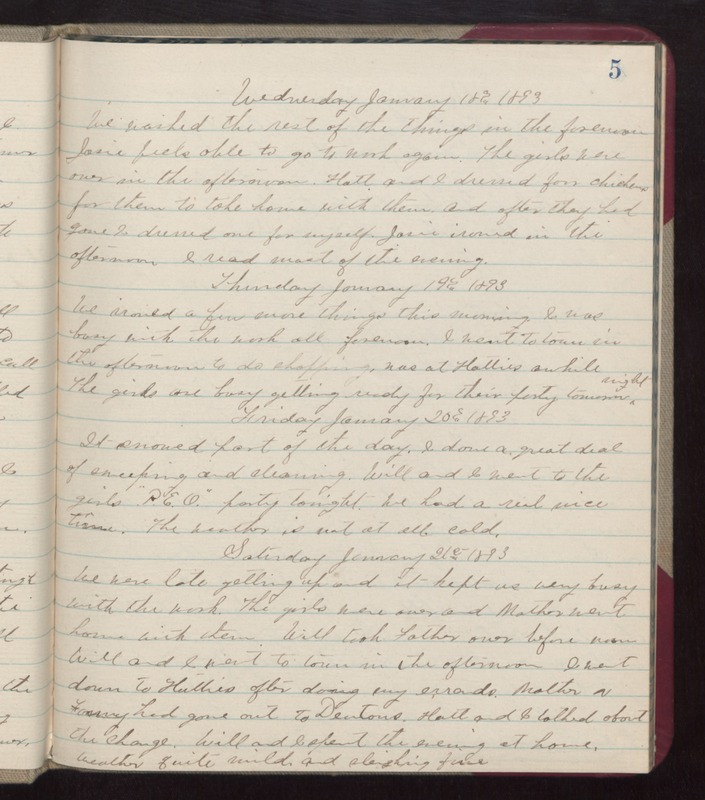 Saturday January 21st 1893 We were late getting up and it kept us very busy with the work. The girls were over and Mother went home with them. Will took Father over before noon. Will and I went to town in the afternoon. I went down to Hatties after doing my errands. Mother & Fanny had gone out to Dentons. Hatt and I talked about the change. Will and I spent the evening at home. Weather quite mild and sleighing fine.